The Beta Alpha chapter was founded on September 13, 2003 at the University of Maryland and has become a very outgoing chapter. Even though we relatively young, we are known throughout the community for our activeness. We volunteer for events with our local animal shelters, teach elementary children about where their food and clothes come from, and fundraise for Heifer International. The chapter also does many local net-working events with professionals within different agricultural industries, professional dress and speech workshops, interview workshops, and resume workshops. Sisterhood is a major aspect of the Beta Alpha chapter. Every semester, we host an overnight retreat to hangout and plan for our next semester. We have traveled to Harpers Ferry, camped at Asseteague Island, stayed at a sister's beach house in Delaware, and spent the weekend at Solomon's Island! The sisters of the Beta Alpha chapter also work hard to put on our Emerald Ball, where at we also invite alumni to come out and get to know the current members. On a more regular basis, we also have small sisterhood get togethers such as group studying, dinner dates, movie nights, gym dates, and crafts. 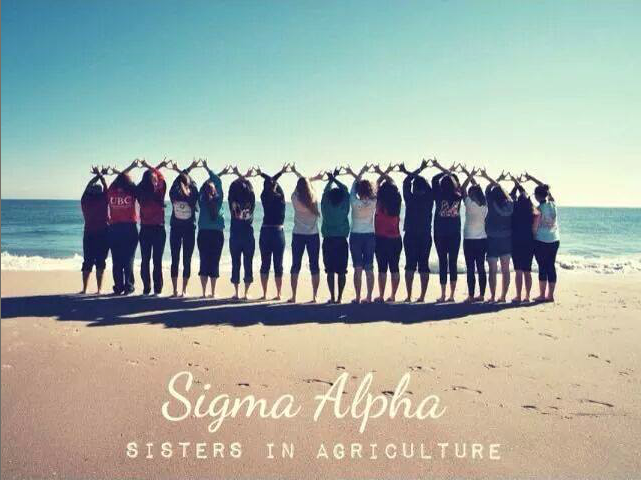 Members of the Sigma Alpha - Beta Alpha Chapter are part of one of three different families. Each family has a unique food, pattern, symbol, and colors. Every little becomes a part of her big sister's family to keep their traditions alive! The cow family's special food is Neopolatin ice cream. Leopards enjoy chocolate covered strawberries. The horse's food is the famous Maryland steamed blue crabs.